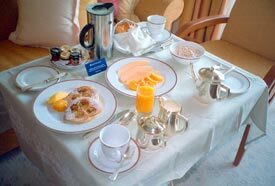 ABOVE: The Silver Whisper's room-service breakfast menu offers pancakes, fresh fruit, pastries, and more. Even on a port-intensive cruise (see Tour Europe by Ship), food is a central part of the cruise experience. Silversea Cruises puts a great emphasis on its culinary and wine offerings, and our 12-day cruise on the Silver Whisper gave us the opportunity to savor everything from Pizza Margherita on our balcony to a dinner created by a Chef de Cuisine from the Restaurant Paul Bocuse in Lyon, France. Breakfast. On tour days, we usually had breakfast in our suite. Our order typically included banana or blueberry pancakes, fresh fruit, Müesli, croissants, and Danish pastries. If we'd wished, we could have had eggs cooked to order with meat, potatoes, or hash; a Scandinavian-style breakfast with cheese and cold cuts; assorted yogurts; or smoked salmon with cream cheese and bagels. The Terrace Café was our other favorite breakfast spot, since we could enjoy the buffet breakfast at a large outdoor table. We had a leisurely breakfast in the Restaurant one morning, with fresh flowers on our table and a view of the sea. If we'd been early risers, we could have started the day with coffee and pastries in the Panorama Lounge or Observation Lounge at 6:30 a.m. Lunch. When we were on the Silver Whisper for lunch, we alternated between the Terrace Café's buffet (which included freshly cooked pasta) and hamburgers or panini at the Poolside Grille. A more elaborate course-by-course lunch was available in the Restaurant, which also was the site of Silversea's traditional Galley Brunch on one of our days at sea. During the Galley Brunch, we followed a red carpet into the kitchen, where the chefs had arranged an elaborate buffet with entrées that ranged from cold seafood to Kalbsbratwurst mit Rösti and other Swiss-German dishes. Dinner. On most evenings, we dined in the Restaurant (the Silver Whisper's main dining room), which has "open seating" rather than assigned tables. We often found ourselves dining with other passengers, either by prior arrangement or on the spur of the moment. We normally arrived just after the Restaurant opened at 7:30 p.m. and lingered until it was time for the evening show in the Viennese Lounge. Restaurant dinners typically offered choices of several hot or cold appetizers, soups, salads, main courses, and desserts. At least one vegetarian entrée was on the menu each night. On a number of evenings, the Restaurant offered a "La Collection du Monde" Signature Dish in association with Relais & Châteaux. We dined twice in the Terrace Café, which becomes an intimate reservations-only theme restaurant for 50 guests on most evenings. One of our favorite meals was a "Cucina Italiana" dinner, which was similar to a chef's tasting menu with various appetizers and pastas leading up to the main course. Other theme dinners during the cruise focused on Greek, French, and Asian cuisine. Updates: In 2004, Silversea converted the Silver Whisper's Le Champagne winetasting room into a dinner restaurant that serves a special chef's menu to no more than 30 guests at a sitting. (There's no extra charge to reserve a table in the restaurant, but wines must be ordered and paid for by the bottle.) In 2005, there were reports that Le Champagne would be converted to a new format (possibly "Asian Fusion" cuisine) and that the Terrace Café would become an Italian restaurant in the evening. Ingredients and portions. Silversea doesn't skimp on its food budget, to judge from the quantities of caviar, foie gras, smoked salmon, and truffles that were available during our cruise. Portions of individual dishes in the Restaurant weren't large, however, because Silversea's corporate chef believes that guests should be able to enjoy a complete meal from appetizers through dessert. If you have a hearty appetite, you're free to order extra portions or to request an entrée (such as a fish or pasta dish) as a first course. Dining alternatives. We enjoyed Silversea's imaginatively prepared cuisine, but if you're ever in a "back to basics" mood, not to worry: The hamburgers and hot dogs at the Pool Grille are cooked just the way you want them, and you can order unadorned steak, salmon, chicken, or spaghetti marinara in the Restaurant when you've had your fill of gourmet cuisine. Each day's menu also has "Cruiselite" options that are low in sodium, fat, and cholesterol. And if you'd rather just stay in your cabin, you can order anything from a snack to a full meal from room service 24 hours a day. We aren't big drinkers, so our "Welcome aboard" bottle of Champagne was carried home and parked on our dining-room buffet to wait for a special occasion. But we drank many excellent table wines on the Silver Whisper, often because we felt guilty in saying "no" to sommeliers who took such obvious pride in the wines they were serving. Accommodations Is Silversea for you?